What Was Sally Ride Referencing When She Called The Shuttle Launch An “E Ticket” Ride? In the early years of the iconic Walt Disney parks, Disneyland, and Walt Disney World there was a multi-step and multi-tier ticketing system. Park goers would first purchase a ticket into the park itself and then would purchase individual tickets to the different rides and amusements found throughout the parks. Over the years the Disney company streamlined the process by selling tickets in “Value Books” which were just bundles of tickets in tiers based on the popularity and value, as it were, of the rides in question. 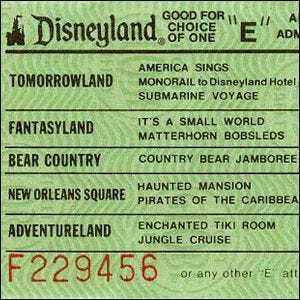 Initially, they used ticket designations A through C, but by the end of the 1950s had expanded the system to include A through E where E was the designation reserved for top tier attractions. Although the tiered coupon system was fully discontinued in June 1982, one year before Sally Ride became the first American woman in space, the concept of the tickets was still fresh in her mind when she described the experience of blasting off into space. When asked what the experience was like she explained “Ever been to Disneyland? …. That was definitely an E Ticket!” to emphasize, without doubt, that the most thrilling ride around was the one offered by a seat in the shuttle cockpit.